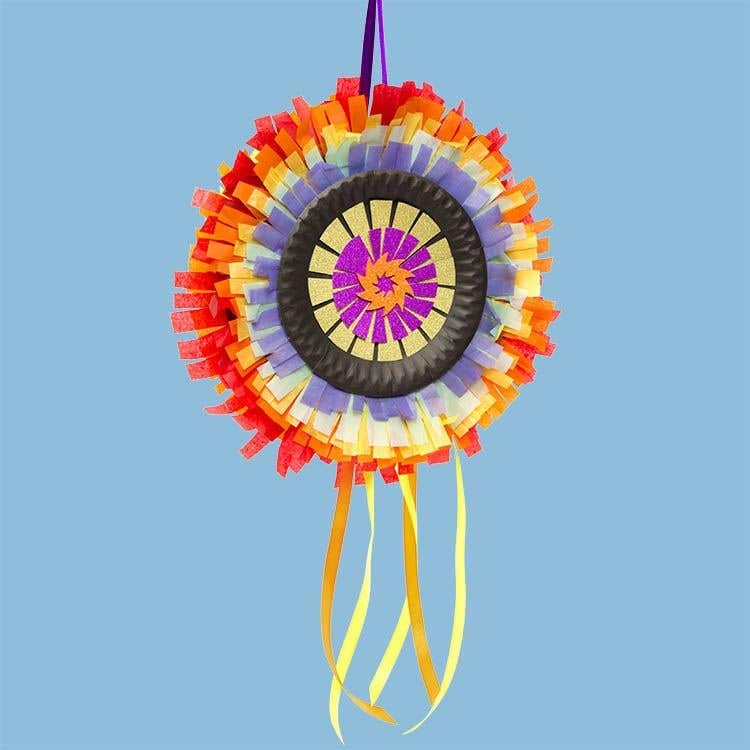 A homemade piñata makes a stunning decoration as a centrepiece for a bonfire night party or a classroom fun activity. Tightly scrunch up 3 sheets of newspaper into 3 balls. Glue the balls onto a cardboard card wreath, so they are evenly spaced in a triangle. Brush glue onto the 3 balls then press another cardboard wreath on top to make a sandwich, with the newspaper balls in the middle. Check the small holes in the wreaths are lined up. Leave the glue to dry. Thread a 50cm piece of ribbon through the holes in the wreath. Tie the ends into a knot to make a loop. To cover the gap around the sides between the wreaths, cut 2 tissue paper strips approximately 15cm x 40cm. Lightly brush glue over of the card wreath facing up. Stick the tissue strip around the edge of the wreath, so it hangs down over the sides. One strip should cover about halfway around. Stick down the second strip in the same way, so the top part of the wreath is covered all the way around. 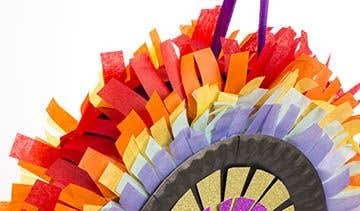 Turn the piñata over, carefully pull the tissue paper across the gap between the 2 card wreaths then glue it down. Don’t pull too tightly or the tissue may tear. To make the piñata stronger, add 2 more tissue strips in the same way to make a second layer over the first one. To make the paper fringes, cut 2 coloured tissue strips 5cm x 40-50 cm. Cutting the strips from folded tissue paper makes this quicker. Leaving the strips folded, make a series of 3cm cuts all the way along the sides then open them out. 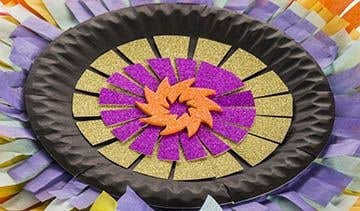 Lightly brush glue around the outer edge of the piñata then start sticking down the first tissue strip, then add another one until you have gone all the way around. 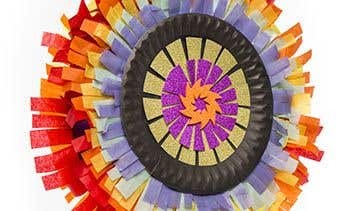 Make more tissue strips in the same way using different colours until you reach the edge of the hole in the middle of the piñata. Glue a small paper plate over the hole to cover it then turn the piñata over. Cut some more tissue paper strips to cover the second side. Before you glue a paper plate to cover the hole, place some small sweets or small toys inside the piñata then glue the plate in place so the piñata is sealed. Add foam shapes to decorate in the middle. Tape 30-40cm strips of ribbon to the base of the piñata on the tissue paper around the edge. If you’ve used a double layer of tissue, make tiny holes in the top layer so the tape is stuck to the tissue underneath. This way, when the ribbon is pulled the tissue will split allowing the sweets to fall out. Alternatively, the sides of the piñata could be hit with a wooden spoon to split the sides open. The piñata can be re-used by carefully covering over the holes in the base after the ribbons have been pulled.